Solar installations - Is my roof suitable? Generally speaking, irradiation is sufficient in almost every region of the country to ensure solar power systems are cost-efficient. As a general rule, solar power systems can be installed in any location where there is sufficient light. A south-facing surface achieves optimum yield at an angle of about 35°. A variation in orientation towards the south-west or south-east or in pitch between 25° and 60° will only reduce the energy yield slightly. Shade produced by trees, adjacent buildings, gables, aerials and similar should be avoided, or can be compensated for to some degree by the use of micro-inverters . 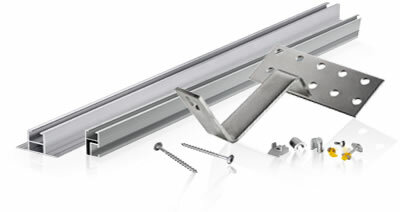 Mounting systems are used in the case of flat roof, pitched roof or open area systems and guarantee an optimum orientation for photovoltaic modules. 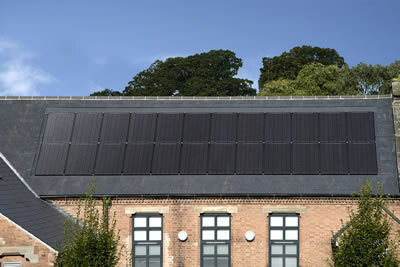 If you live in Wales, and have been refused a solar panel installation, contact us to find out if we can help. Many of our customers had been turned down because their roof was deemed "unsuitable" for a variety of reasons and are now enjoying the benefits. For all existing pitched roof surfaces: an on-roof system is installed without affecting the impermeability of the membrane on an existing roof. For flat roofs, there are frame and tub systems which securely support modules at an optimum angle to the sun. Systems which can be perfectly adjusted to varying or uneven substrates and landscapes; used as stand-alone applications or in solar parks.